One of the words that I would happily call myself is indecisive. I know I am, it's a flaw I have. I have been known to take about half an hour to decide what colour dress to buy, and then leave without buying it. I just can't help it! Another thing that I'm quite indecisive about is my hair. As soon as I lobbed it all off, although I did love it, there was a small part of me that died a little inside. All that hair and possibilities of undoes ect was just gone! Like I said, very indecisive! Because I was quite eager for my long hair to come back, I started using the Reversyl Follicle and Fibre shampoo and the Hair Growth spray treatment every day in an attempt to speed up my hair growing process. If you’ve not heard of Reversyl, they’re a British company who are dedicated to developing products to help those experiencing hair loss. Obviously I’m not experiencing hair loss, but the shampoo and hair treatment duo are also brilliant for thinning hair and the formula helps condition and thicken the follicles in your hair - which helps to promote hair growth! That is my reasoning. I’ve been using both products for nearly a month now and although I stupidly didn’t take a proper before picture to compare, I can honest say that I’ve noticed such a difference to my hair. Not only does my hair seem to have grown a few extra inches but it’s noticeably thicker and shinier. A lot more than another shampoo, serum or oil I've tried in the past. The shampoo is probably my fave out of the two as the smell was absolutely gorgeous! If I'm honest it did slightly remind me of men's aftershave or Lynx but I actually liked that - is that weird? The treatment spray had a very particular smell and from my nose I got the whiff of fish. Not very nice. 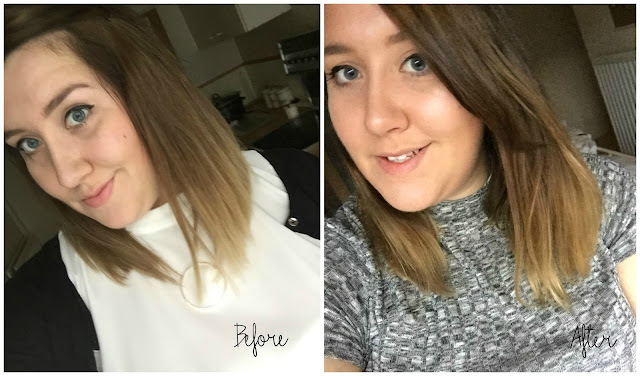 I was a bad beauty blogger and didn't take a proper before and after picture but to sort of give you a small idea on the change, the above before picture is a selfie that I took at the end of October with my hair being straightened and the after picture was a few weeks ago with it unstraightened. And it's around the same length, if not longer and definitely a lot thicker! So I'd say that's quite impressive! Overall I really enjoyed using these products and I would happily fork out that bit extra to buy them both again. If you're like me and would prefer a nice thickening specialised product, then this is the brand for you! If you fancy giving it a go then you can check out the shampoo and treatment spray combo here for £34.99! *I was sent this product to trial but my opinions are honest and my own. That's a crazy difference in such a short time! You hair looks amazing Nat! Wow you can actually notice a huge difference! & in such a short time!